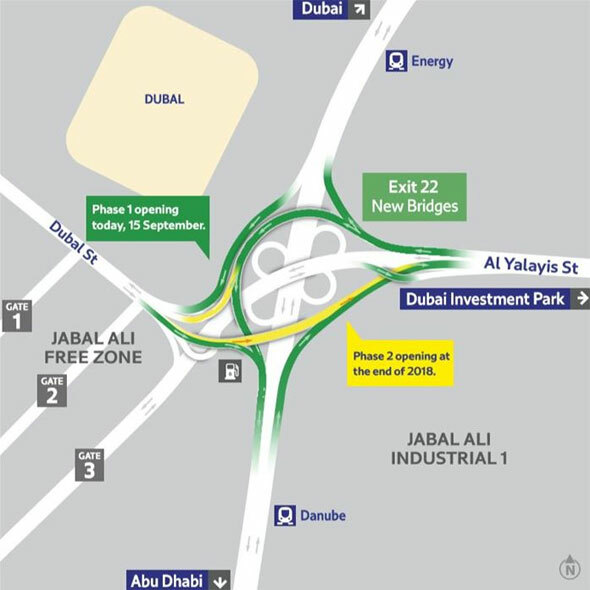 A new interchange is now open at the Jebel Ali end of Sheikh Zayed Road in a bid to ease traffic flow in the area. The opening of this new interchange will allow drivers to avoid a new toll gate will be introduced near Ibn Battuta Mall later this year, by diverting them to Sheikh Mohammed Bin Zayed Road via Al Yalayes Road. it will also enhance the link between Sheikh Zayed Road and both Sheikh Mohammed bin Zayed Road and Emirates Road. The opening of the first phase of the 7th Interchange Project will encourage drivers to take the Al Yalayes road to Sheikh Mohammed Bin Zayed Road and on to Emirates Road when coming inbound to Dubai from Jebel Ali. The project aims to increase the capacity of Al Yalayes road to an impressive 20,000 vehicles per hour in both directions. The construction included adding three lanes onto Al Yalayes road coming from Sheikh Zayed Road, and a further two lanes from Al Yalais back to Sheikh Zayed Road in the direction of Dubai. An additional four lane bridge branches out from Al Yalayes road, with two lanes heading to Jebel Ali Free Zone and Port, and two in the direction of Jebel Ali. A second phase of the project will improve traffic flow from Sheikh Zayed Road to Dubal Street, and will open in the last quarter of the year.